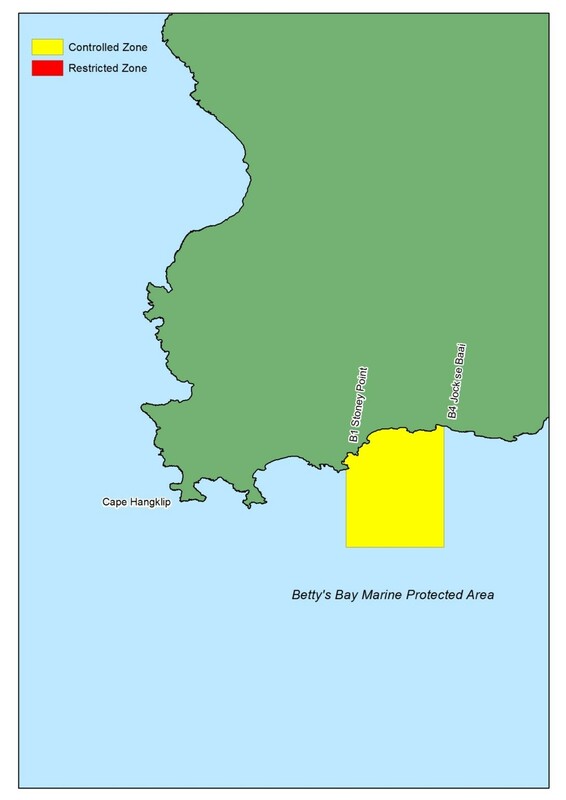 Betty’s Bay MPA is one of the smaller MPAs and no fishing is allowed off a vessel within its boundaries, but you are allowed to angle from the shore if you have the necessary permits. The Stony Point African penguin colony located within this MPA draws a lot of tourists, causing challenges for CapeNature who manage the facility. The MPA is located in Betty’s Bay, which lies along the Atlantic Ocean on the Southern Cape coast of South Africa. It forms part of the Kogelberg Biosphere Reserve in Overstrand Municipality and lies approximately 29km south-east of Gordon’s Bay and 37km north-west of Hermanus. Stretching along 3km of coastline, the MPA comprises the inshore marine environment between two beacons – one on the west side at Stony Point and the other on the east side at Jock’s Bay. The Betty’s Bay MPA is under threat from local and out-of-town poachers who target the MPA’s protected resident abalone resources. To diminish any conflict that may arise from competing uses in that area.